Daytime talk show host (“The Talk”) and primetime talent competition judge (“America’s Got Talent”) Sharon Osbourne was diagnosed with colon cancer in 2002. While the cancer reportedly spread, Sharon triumphantly won the battle. 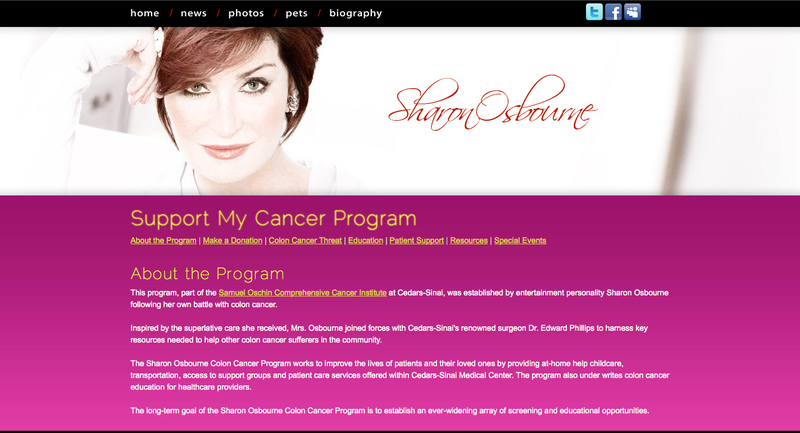 She subsequently founded The Sharon Osbourne Colon Cancer Program, in affiliation with Cedars-Sinai Medical Center in Los Angeles. Screening and prevention are two of the many key elements of the program, and to find out more details, you can visit Mrs. O’s website, cited above, as well as the American Cancer Society’s website at: http://www.cancer.org. ← We “like” Celebrity Optimist on Facebook!